Today is the day in which I'm going to share all the secrets for perfect picture locations. 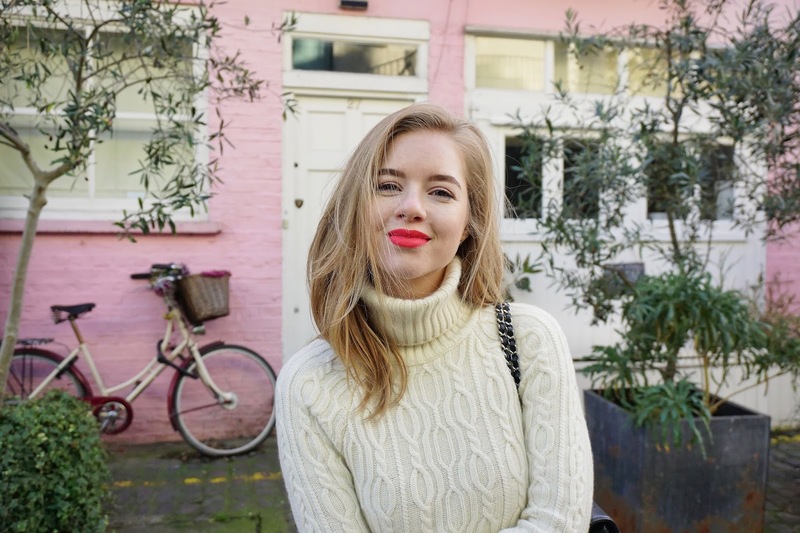 Don't you just hate it when you find a gorgeous background in someone's picture either on Instagram, their blog or Pinterest and when you check out the location tag it says something general like Notting Hill or Primrose Hill? Honestly, it drives me crazy that some bloggers try to keep their locations secret, as if others shouldn't have access to them. With one of my best girlfriends visiting me in London, we were on a mission to find the cutest and prettiest, for us, locations to shoot in. While searching through the pictures I had saved on Instagram, something became very clear: everyone tags general locations. 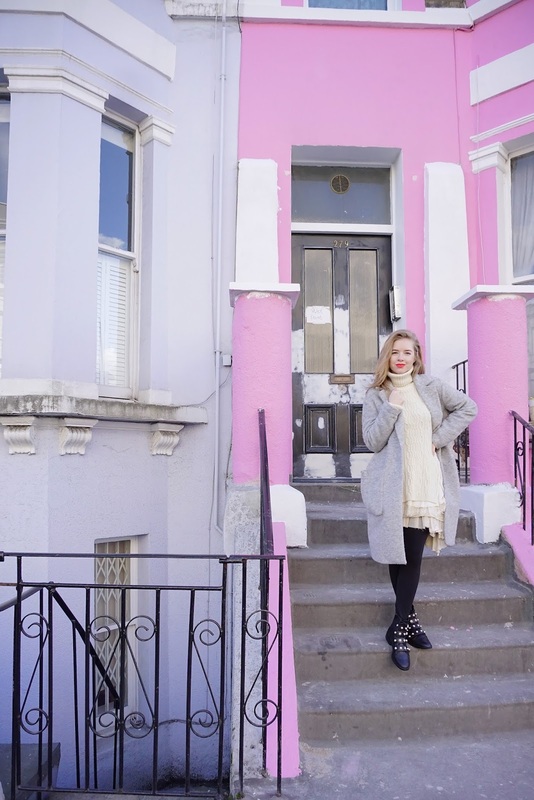 Today I'm going to tell where these fabulous locations are, in case you visit London and want to snap a picture next to a fabulously pink or pastel house. 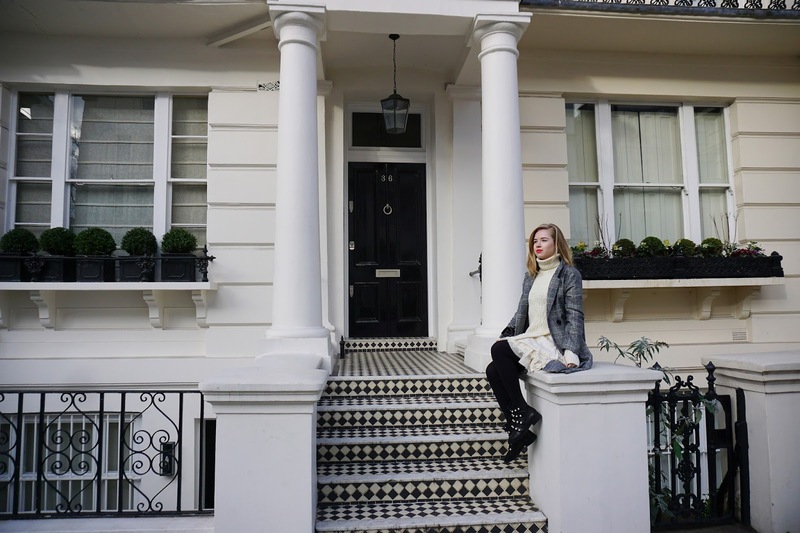 This time around, we were looking for girly pastel locations, which thank God, London has a lot of, mostly concentrated in the North West area. I quite enjoyed researching the locations, taking the pics and writing this post, so if you do too, I'll create more of them. Let me know. Now, are you ready? This has got to be the girliest and cutest cafe I have ever visited and drank a coffee in. Of course I'm taking about the Peggy Porschen Cakes cafe. The downside is that it is always packed and the interior is way smaller than you would expect. You're probably asking yourself by now if it's worth it and the answer is yes, 1000 times yes. The cakes are delicious and they have alternative dairy and soy options for your coffee. They change up the exterior decor according to the seasons, which means I'll have to come back in spring and summer. You will be happy to know this is the only Instagramable location included where a consumption is required. Next on our list is Bywater Street, which has a combination of pastel and bright colored houses. If pink isn't your thing, you could go for blue, lilac, greens. Whatever floats your boat. The downside here is that someone living there could go out or try to get in, in which case you might look weird, but look how cute the houses are, it's totally worth it. Let's take a break from the pastel and admire some white houses with black and white entrance floor. They are beyond fabulous and so many of them on one street, you could literally chose the door you like. 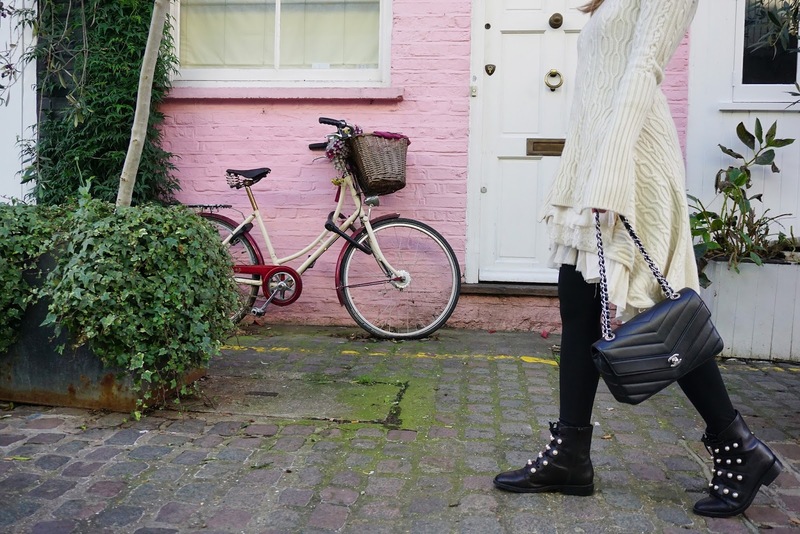 Notting Hill is honestly full of them, but one of the streets you'll find them on is Kensington Park Road and the surrounding streets. 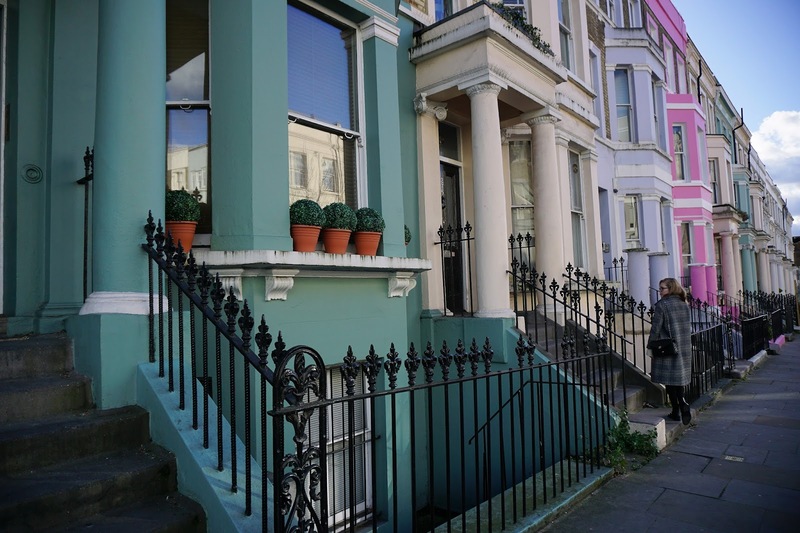 Let's inject some color in our life and get back to the bright colorful houses, this time in the Notting Hill area on Westbourne Park Road. 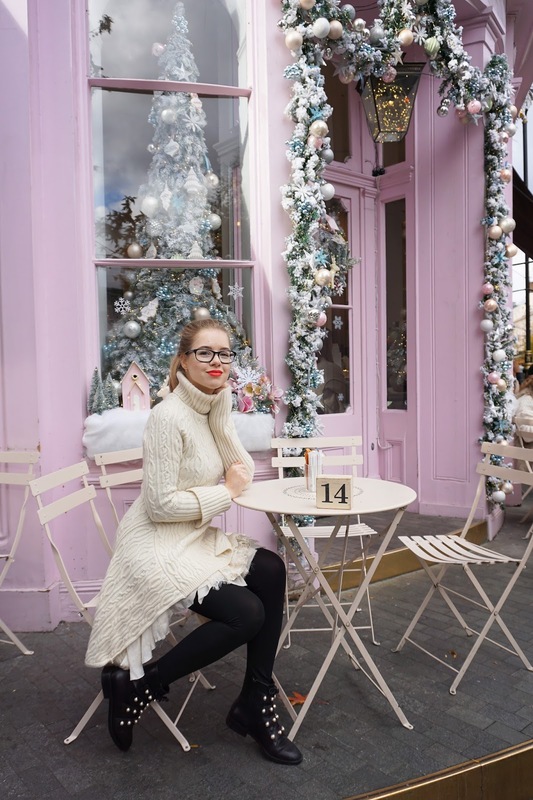 These are close to the Portobello market, so after having a look there or a coffee/tea in that area stop for some pictures with a cute background. The whole area is surrounded by cute houses, so just have a look around and pick your favorite. 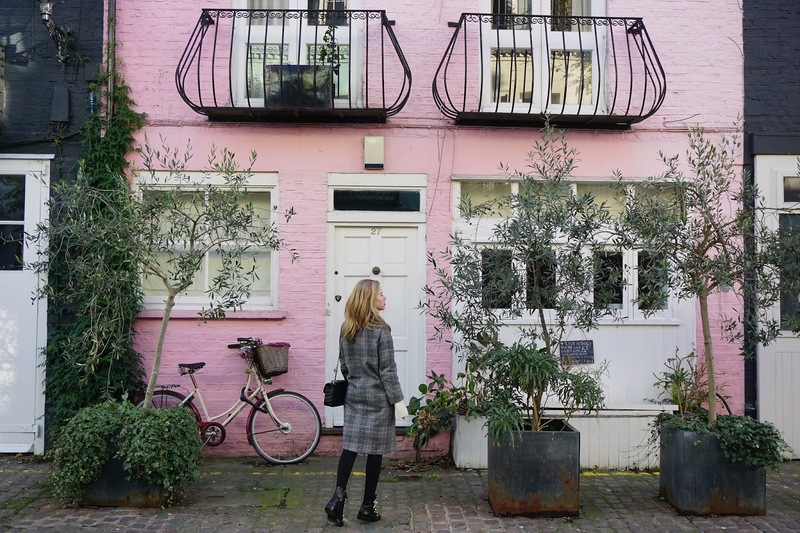 Our last location is my favorite, located on St Lukes Mews. This is the cutest pink house with its lovely balconies and adorable bike. One that you've probably seen in more Instagram pictures than you could count and always wondered where it is, well here you have it. With all these locations be extremely polite and respectful when shooting, after all people live there and you wouldn't like having noisy people outside your house. Always keep in mind how you would feel if someone acted rudely. 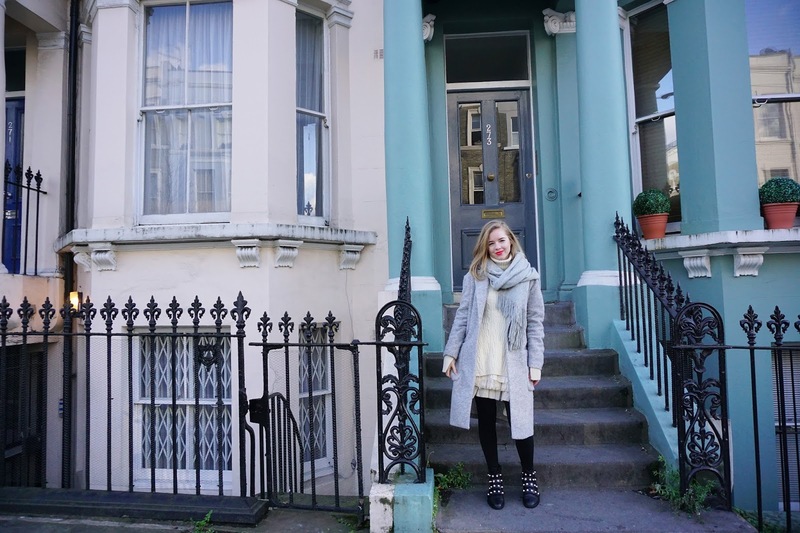 I was in Notting Hill last week and definitely snapped some pictures there! ;) The only location I haven't visited yet is the Peggy Porschen Cakes cafe, I guess I'm going to have to see it for myself! Wow amazing place, so lovely! U look wonderful too. Great post dear, so nice and interesting. Great places! They're all so cute! Great post dear, I really like it!!!! Thanks for this FYI. I'm always seeing so many fabulous pics emerging out of Notting Hill and been dreaming of wandering around its streets for ages now! Oh such a cute and helpful post Carina, thanks so much! 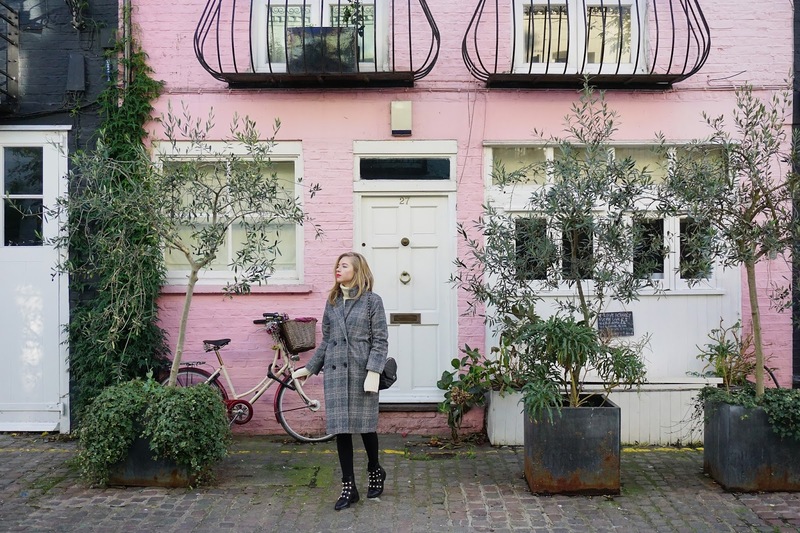 It is true that sometimes it's difficult to pinpoint those stunning locations even if everyone on Instagram seems to know exactly where they are :P Love Notting Hill and the Kensington Park Road checkered entrances and you look beyond fab on all of these shots ♥ Happy week, dear! You look beautiful and amazing.